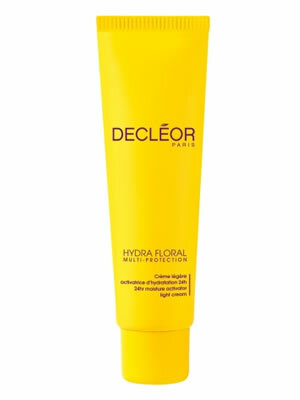 Decleor Hydra Floral Light Cream uses the latest in hydration innovation with a light formula. This moisturiser offers 24-hour hydration and multi-protection. This Hydra Floral moisturiser is soft to the touch without any stickiness. After use the skin is full of moisture just like a flower. It is perfectly hydrated and fresh. Optimally protected, its beauty is preserved.Its unique formulation includes moisture-boosting active ingredients to deliver immediate and long-lasting hydration, plus powerful plant extracts to help protect the skin and preserve its youthful radiance. Inspired by the natural ability of plants to keep their flowers optimally hydrated from dawn until dusk, our Hydra Floral range uses innovative ingredients and technology to mimic a plant’s remarkable hydration process and keep you fresh-faced and beautiful all day long.After just one application, 85% of women noticed their skin was revitalised and softer. Use with Aromessence™ Neroli Super Serum for optimal results. Suitable for all skin types, including oily skin. Decleor Aroma Cleanse Essential Cleansing Milk is a light-textured emulsion for perfect cleansing and make-up removal on all skin types. This cleansing milk is a professional strength cleanser with a sparkling fragrance. Decleor Aromessence Neroli Essential Serum is adored by beauty industry experts and the winner of ‘Best Facial Oil’ at the InStyle Magazine Best Beauty Buys Awards for six consecutive years, it has a unique blend of essential oils to help hydrate and revitalise all skin types.